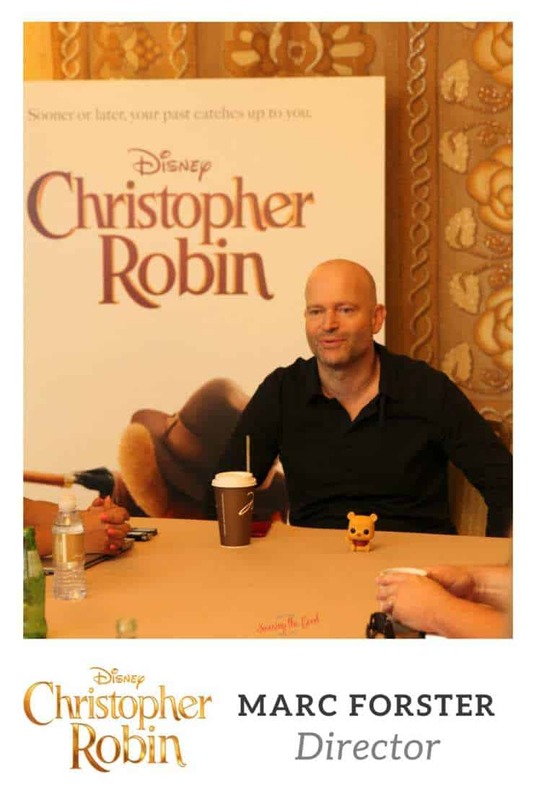 Marc Forster is the director of Christopher Robin and he sat down with our interview team to take us through the process of bring our favorite Winnie The Pooh characters to life in Christopher Robin. Be sure to read up on the rest of my interviews with the cast of Christopher Robin. Hayley Atwell is Evelyn Robin, Jim Cummings The Voice of Pooh and Tigger, Ewan McGregor The Voice Of Christopher Robin, all about the Christopher Robin Red Carpet. Be sure to much on my Winnie The Pooh chocolate bark while you read! How did Marc Forster go about choosing the cast for Christopher Robin? It started basically that Ewan and I worked together, in 2004, and we stayed friends for a long time. We have been looking to do something together, comedically and dramatically, He’s so good, but the one thing is there’s something about him, he’s so likeable and so lovely. You want to just connect with him and you want him that his heart opens again and he becomes playful and he reconnects with his family. And so you really root for him and it was really crucial to have an actor who has that sort of ability because otherwise, you suddenly don’t connect with him or don’t want to root for him because he said okay, rather not connect with your family again. The movie for me ultimately is about love. His red sweater is sort of like this metaphor for love. I always felt like it’s about the heart. How did Marc Forster get involved as the director as Christopher Robin? I was in a plane with my daughter and we were flying to a vacation and she’s watching an iPad with a Pooh cartoon. She suddenly turned to me and said, hey, can’t you make a movie for kids once? All your movies are dark and for grownups and said I can’t watch any of them. She was six at the time and said, I said, yeah, why don’t we do Pooh, I said jokingly. Why don’t do Pooh? And then ultimately, I started, I came back and all the stars aligned. And three years later, we made Pooh. Yeah, indirectly. It’s sort of life imitates art or art imitates life. Especially the last few months when she said I never see you. I said, yes, because I have to finish a movie for August third. How did Marc Forster make sure everything was historically correct in Christopher Robin? We did a lot of research and sort of the idea was to going back to the mid Twenties when Pooh was created, Chris Robin played with him and then pick up the movie basically when Chris gets sent to boarding school. Then the film ends sort of like at post war nineteen forty-nine and the interesting thing is also just in the early Fifties was actually a time and in England, people had suddenly paid vacation. So that all sort of aligned with our storytelling of Winslow Luggage. When he brings up this idea of being important for people to do nothing and we take a vacation and sort of enjoy that. Marc Forster on the set of Disney’s live-action adventure CHRISTOPHER ROBIN. The metaphor you may have missed in Christopher Robin, as told by director Marc Forster. I like metaphors in general. I wanted the film to end suddenly with him, Ewan, with his sweater too short. It’s like the film is too short as well. I just thought it was funny. For instance, the daughter leaves the drawing for him and when she finds the drawing, said I didn’t realize you could draw as well and then he hits the table and then the honey falls down, it’s sort of like, the honey obviously is supposed to then wake up Pooh. Because the idea was that when he actually sees the drawings, that’s sort of when they come back in is consciousness and that’s sort of like when the animals sort of come alive again, in a sense. How many versions of the 100 Acre wood animals did Marc Forster go through until they were just right? Michael Kutsche, the character designer, and I went back to the Shephard early drawings and I showed him the first black and white animation drawings from Disney and then I said, look, I love this about the Shephard ones, this about the early Disney drawings. Let’s combine it and then he started drawing them and creating 3D models. And then we started pre-production, at all these different materials that to feel like, to find the right material. And then Jenny Beavan knitted the red sweater and we created that stuffed animal based on his drawings. It took us a couple months to get it right. Then also I wanted them to all feel hugged and loved. That they were not new sort of stuffed animals off the shelf. That they felt that the boy played with them and there was sort of a history between them. Where was Christopher Robin filmed? We shot lots of in Ashdown Forrest. Literally next to where Milne’s estate is and where the real forest was. Probably ten miles down the road from where we shot was the little river where we built our Pooh bridge. It is connected to the same river the real Pooh bridge is, so it’s all the same woods and neighborhood. We shot a little bit of also Windsor Park and outside Windsor Castle. Where sort of the Queen’s park is. The great thing about that particular forest is that the Queen park is sort of untouched. Every tree that falls down can’t be touched. Everything is just how nature brings it and it’s very wild and looks also very beautiful. I would say fifteen percent there and the rest at Ashdown. Easter eggs in Christopher Robin. Stay for the end of the credits. I think for me the Richard Sherman was the Easter egg in a sense. I thought it would be great if Richard Sherman would write me one song, because he’s like ninety years old and then he suddenly came back with three songs. We only wanted the song for the beginning, but then the other songs were so incredible, I said, we have to put them in there. I felt suddenly it would be great to show them all on a beach and we didn’t have it in the schedule and it wasn’t really budgeted and I said to line producer, you know what? I’m just gonna. It was right where we shot the train station set when he’s running through the train station. Next to the train station was the beach. I said to line producer, you know, I’m just going to over to the beach. We have so many extras here. Just stick them in bathing suits, run over, I’m taking a camera. Just shoot it. I can do this in two hours. We’re running over there and I suddenly said now we need the piano on the beach as well. Have him play the piano and then the sort of the idea was handing over something where Darren said, would be a great idea. All came spontaneous to me to put the four chairs next to the guys and put the animals in there. Ultimately, that all came literally within five minutes. Put the four chairs and then we did one take of that and the two actors sit there eating the ice cream. And said, you know, I think things are changing and it’s for the better. Then we just move over and there were the four animals. I showed the film to a friend of mine and he said to me, you know my favorite Eeyore quote. “Thank you for noticing me.” It’s not in the movie. I said oh, we have to put the, that quote in the movie, so I’m going through the movie and I can’t find the right spot, so I’m going to the end part was the, was where they sit, all the four of them and I have Eeyore go, “thank you for noticing me” as the last last line. What is the most powerful scene in Christopher Robin? I think for me one of the scenes which I love is the center scene when Ewan McGregor sits down next to Pooh and explains to him, he isn’t himself anymore and apologized to him. Ultimately seeing that, that hug and then Pooh says, you’re squeezing me again. I just love it because ultimately, it’s about Ewan waking up. Chris Robin realizes who he really is and what he has become and from then on, he makes a change. And then when he’s in the train and starts playing the game that Pooh played earlier, it’s sort of very sweet.